CMYK and RGB are acronyms that refer to color models used to create images and files. CMYK color mode is used for printing. The RGB color mode is used to display images that are intended to be viewed on monitors and screens only. We’ll look at the difference and help you understand the difference and explain CMYK or RGB for print. CMYK stands for Cyan, Magenta, Yellow, and Black. These four primary ink colors are combined in varying amounts to create a wide variety of colors for printing. You should always request a CMYK copy of your logo or any other file that you would like to have printed from your graphic designer. 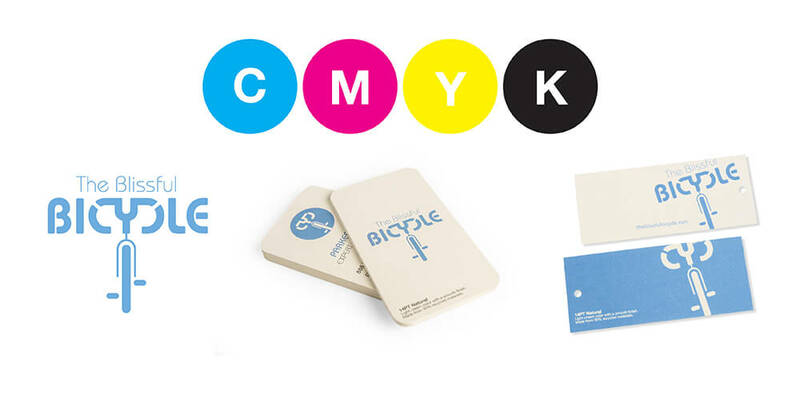 The above Blissful Bicycle logo and marketing materials look as though they were printed with blue ink but in actuality, the blue color is made up of 55% Cyan ink and 22% Magenta ink. When the two color values are combined for printing, the above blue is the result. RGB stands for Red, Green, and Blue. These colors are lights that are mixed to create and display digital images on screens and electronic devices. Images created using RGB color mode can display very vibrantly, but those bright neon colors are not able to be reproduced using CMYK inks. When you try to print files that are intended to be viewed digitally on a screen, the print color outcome will be much different than what appears on your screen. Here is an example of what an RGB file looks like on screen in comparison to how it looks when converted to CMYK for printing. If your file is going to be printed, it needs to be set up in CMYK color mode. How can you make sure your file is set up in CMYK? Below are the steps to check your print files using popular Adobe design software. Do you need help with a custom design? Click here to get started and one of our in-house graphic designers will be in touch with you soon. PreviousWhat is CMYK Rich Black Build?